Occupy Wall Street began one year ago and continues to gather folks in locations around the world. Attending general assembly meetings in Seattle, I was impressed with the range of protesters from student revolutionaries to recovering addicts to curious bystanders. Can the 99% and 1% find common ground? Does orchestral music provide a solution for democracy in the 21st century? Drawing reverse inspiration from Joseph Haydn’s “Farewell” Symphony composed in 1772, Occupy Orchestra convenes classical musicians and listeners. Additionally, the large-scale work gains intimacy in the philosophical musings of John Cage. Each page of the score provides a koan—a “matter for public thought”—that goes beyond logical reasoning to provoke insight. Haydn composed his 45th Symphony as a way to persuade Prince Nikolaus Esterházy to allow court musicians to return home. In the score, musicians play a solo, snuff out their candle then leave the stage. This playful protest music successfully persuaded the orchestra’s patron to give the musicians leave. 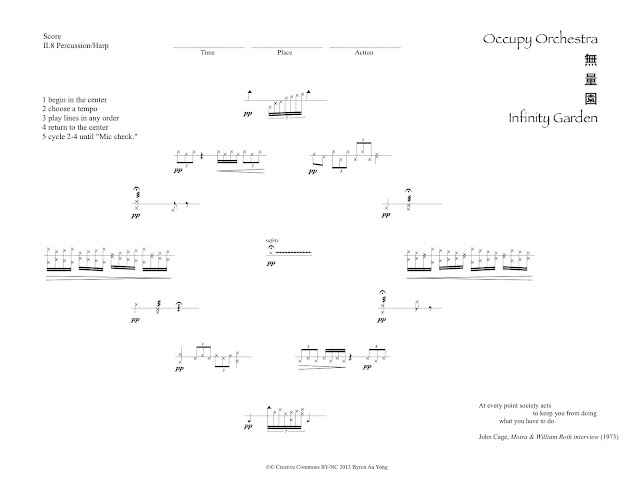 Occupy Orchestra provides a “hello” experience for the audience. Musicians play Street Variations as soloists then gather into an ensemble. Listeners walk around the concert venue possibly tuning their ears to a bassoon, then a tuba, then a viola as musicians physically and sonically converge. Initially, the audience interacts with these “busking” musicians, by offering pages of the score notated in graphic notation. The score also provides koans for the listener to reflect on their role as citizens in the new millennium. Ultimately, Occupy Orchestra pays attention to a process of gathering listeners for the pleasurable and reflective space of symphonic music with how musical labor performs as the world shifts from a post-industrial economy to address future economic, environmental and societal realities.